Being a leader in the industry, we are engaged in offering a qualitative range of Bimetallic Connector. In India some State Electricity Boards use bi-metallic connectors instead of connecting lugs. 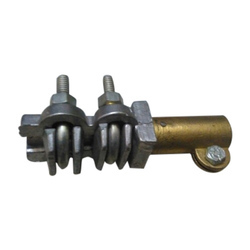 • These are generally made by combination of brass and aluminium in which aluminium part is the line connecting part and brass part is the stem connecting part. 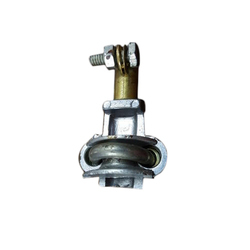 Bi-Metallic Connectors ( Brass-Aluminium, Bronze-Aluminium, Copper-Aluminium ) are also manufactured as per specific drawings from the clients. These are made from Electrolytic Grade Copper Castings, Brass/Aluminium Die Castings, Galvanised M.S./ S.S. Nuts, Bolts and clamps. A connector design for connecting of two or more conductor of different materials (normally copper & aluminium conductors) for preventing electrolytic corrosion.